This real butterfly wing necklace is made with Podotricha telesiphe AKA Angel-Winged Telesiphe butterfly. Butterfly died naturally after its lifespan. Purchases help save the rain forest and butterfly populations. 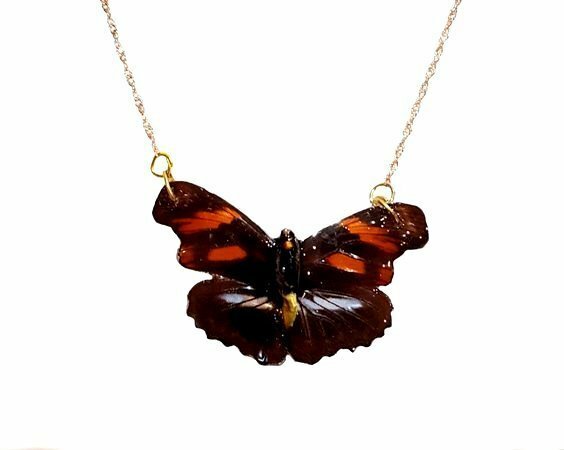 This real butterfly wing necklace is elegant, and perfection. Real butterfly wing jewelry is handmade. Butterfly coated in resin for longevity. This real butterfly wing necklace design is original and exclusively only at The Blue Goddess Co. We are the leading experts in real butterfly wing jewelry. WE have the only design were we use the natural whole butterfly. 18k Rose Gold filled Wave Chain.